If a play is sente, under normal circumstances the player whose sente it is will be able to make the play with sente before the opponent can afford to make the reverse sente. We say that the sente player has the privilege of making the play. Privilege is one characteristic of sente. 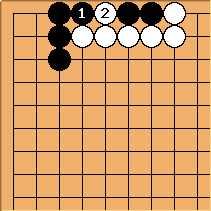 The expected course of events is that Black will make the sente move of before White would play the gote move at . This is an ambiguous position. Black has the privilege of playing with sente, but may also play at 2 with gote. The assertion of privilege is that the play can, at present, be ruled out of order of play considerations. Evidently this state of affairs is something that may persist for a while; but not for ever. It is usually (not always) skilful to postpone certain types of sente play, until the 'last moment' - when the privilege is about to lapse. Other things being equal (which they are often not, in any simple-minded sense) it is a good idea to keep options open, flexibility, avoid aji keshi, retain ko threats and so on. On the other hand, if there is a clear way to win by playing out one's sente endgame, this is typically the right approach. Question (xela): I've heard the word privilege used as though it's a stronger concept than sente--in other words, there might be (abnormal?) circumstances in which a move is, say, black's sente but not black's privilege. Is this correct? Can anyone give a clear example of how this might happen? Bill: The concept of privilege tells us that, if there is a sente on the board but there are also larger plays, we expect that the sente will be played with sente, and the reverse sente will not be played. There are exceptions, of course. Privilege just tells us what to expect under normal circumstances. If the reverse sente is the largest play on the board, the concept of privilege does not apply. Bass: The privilege seems to arise whenever the value of the follow-up is much larger than the value of the move itself. The bigger this difference is, the greater is the probability that at some point of the game the value of playing elsewhere is between those two, which is when the move can be played in sente. If the follow-up is very big, then the move can be played at any time, even as a ko threat. If the value of the move itself is very small, then the move can be delayed as long as there are bigger plays elsewhere. BuggyMind: So "Black's privilege" is a euphemism for "White has better things to do than play reverse sente", right? PJTraill: There is a new page kenri saying: “The right to perform a certain action (権利）”; if privilege is the conventional translation of kenri in go literature, that (or this) page should be made an alias and the Japanese term (including kanji) added to the text currently here.